Q. What are you doing right now and what are you crusading for at present, after leaving journalism? Ans: I have always been a nationalist and my crusade in the past as a journalist or at present has always been working for the country and countrymen be it within the country or internationally. I personally believe that Nepal should be a leader of the world and rule the world because according to the mythology in the beginning the Lord Shiva ruled in all the 1008 galaxies. Later on the Lord Shiva decided to hand over the rule of the heavens to Lord Indra and the earth to be ruled by Masta. People therefore used to say King of the heavens Indra and King of the earth Masta. I therefore feel that we should not forget our culture, tradition, time and religion and let all of these be eroded.The erosion started with the signing of the Sugauli Treaty where we lost 60,000 hectors of our land and was handed over to foreigners and due to this 7 crores people were cut off from their homeland. I was and have been fighting for this cause politically as well as a journalist to have this land returned to Nepal. I have always been an advocate for the rights of the smaller nations and fighting for the cause of the small nations internationally. Even during my student life I led 150 thousand students and surrounded the Indian embassy in Nepal when Sikkim was annexed by India. There are certain countries in South Asia which have expansionist character and due to this have corroded the nature of many nations. Furthermore the power behind all this is the West and the powerful countries who according to their neo colonial ideas have made Nepal very weak due to various activities. The pillars which marked our borders, erected by Jung Bahadurhas been moved for example the pillar which used to be situated in Galgalia has been brought to our side all the way to Bhadrapur. The whole of Mechi River is now in India due to this. In the west of Nepal too the same thing is happening. Pillars have been moved from LimpiaDhura to Lipulek. Regarding Lipulek a very good neighbour and who we Nepalese thought was our good friend and backbone of our nation China has also betrayed us. Another sad part is that our leaders, intellectuals or any type of power are all keeping mum regarding this issue. Therefore I have taken upon myself to highlight this issue as all concerned have been influenced by this or the other super powers including our prime ministers. I have been speaking on this issue in various forums and I feel I am right because even the social scientist from Norway Johan Galtung has said that peace process in Nepal has been derailed as a force of royalty has been set aside. An example is Sikkim where the king was ousted first and then the country was annexed.There are many similar examples like Kashmir, Afghanistan etc. I feel that Nepal is following suit as I see no reason for the ousting of the King in Nepal. Why was he ousted and what were the forces that ousted the King? I am always against all those forces that have tried to weaken our country and play a divisive role. I am a true republican and I believe that nation comes before political ideologies, country comes before political ideologies and our motherland comes before ideologies but sad to say no one seems to understand this and are not working for the motherland but have become lackeys of the super powers and slaves to their ideologies. Although I am a Republican and a professional I have come to realize that professionalism cannot save our motherland and therefore have taken the onus to fight for our Motherland by raising myself above my ideology and gathered likeminded professionals who knows the true values, culture, tradition and history of our motherland and come to the fore to save my motherland. Q. You have always been a progressive and a Maoist in your student life and even as a journalist. Many of your followers have become ministers and even deputy prime minister but now why are you raising your voice against secularism, republicanism and federalism? Ans: The reason for that is we at present do not have the federal state that I had envisioned and the big powers have hijacked the federal agenda and used it for their selfish reason. An example is the present dispute regarding the No 5 federal state. Some powers have even gone to the extent of hijacking the birth place of Lord Buddha, Lumbini without understanding the history and culture of this area and this is not federalism. Lenin himself had envisioned that a federal state has to be bound with the culture, history and tradition of that state. Division of states is not happening according to Lenin’s principle but in the interest of some super powers as the home minister of our country was sent as an official delegate to Delhi and a readymade version was sent from Delhi which the government is trying to implement. This is not the federalism that I had envisioned and that I want to rule in the future as the federalism will not have been implemented according to the principle of Federalism. History has shown that Nepal is a country of federal states and in 1503 when NawabShansudin attacked Nepal then all the kings of different states united and when the king of Kathmandu was killed by another king of another state King Harsingh Dev. He ruled here and when he died of Malaria his queen Myaulla Devi ruled for sometimes. As she could not rule properly a young king from Jumla,SthitiMalla was brought as the King of Kathmandu and he started to rule Nepal. As he was able to take control of the Kingdom and rule properly he was honoured by the people and said “Jaya Jaya” and so was known as JayasthitiMalla in the history of Nepal. Nepal has its own history and has been a federal state and living in peace and harmony since very long ago and it is a land of King of Kings. The ruler of Nepal has been shifting according to the states from time to time just like in Switzerland or Malaysia as there was a Kirati ruler, a Khas ruler, a Madhesi ruler and Himali ruler. This is a land ruled by Masta and later on by Manu who ruled the world and was King of the seven oceans. Nepal is the best country in the world if one looks at it both culturally and historically. Just for an example, in South America if one looks closely at its religious history then one finds that the biggest temple there is Machu Picho which was built for sun worshipper, the same goes for England where the Stone Hinge was built by the sun worshippers and in Japan AmaTeresi also is a sun worshipping temple. This proves that people all over the world was ruled by one powerful king and that was Manu who was of the Surya banshi (Sun lineage) and his kingdom was beside the Surya river(Karnali) and he ruled all the five continents. Now the people who do not know all this history of Nepal are trying to carve Nepal without any knowledge. It is also a known fact that the King of Nepal is given the title of Shree Panch and this is because he is the ruler of all the five continents as Panch means five therefore can anyone imagine a Nepal without a King? Nepal’s king who is supposed to be the sovereign of all the countries cannot be set aside and I do not know if any true Nepali can envision a Nepal without a king . Therefore although a republican, I have put aside my ideologies and looking at the history and culture of Nepal I cannot imagine a Nepal without a king and want an immediate return of the Monarchy in Nepal. Q. Why were you a communist? Was it due to lack of knowledge and now that you have sufficient knowledge regarding Nepal have become a monarchist? Ans: No, I have never changed my ideologies, I was always a Maoist and will always be one and I believe in the theory of Chairman Mao where we can build our country by the proletariat of the nation and there will be space for the monarchy as well. I also believe that there should be a president rule but there should be space for monarchy as well and we should follow the footsteps of the federal states like in Switzerland to be a country like Switzerland. However I have to admit that I have come to realize that the political vision of having a constitutional parliament for which I was agitating for all along my political carrier was the agenda of Delhi all along. This fact has been proven as this has been documented in a book written by Dr. Shree Ram Sharma Upadhayawhere on page No 394 it states that when KaisarShamsher and BijayShamsher had gone to Delhi for negotiation one of the deals offered to the Ranas was constituent assembly. This just shows that this slogan of constituent assembly is an idea of the western power houses which wanted to divide and rule Nepal and therefore realizing this I have now taken stance against this type of constituent assembly. I further believe that all the decisions, actions and intentions of this constituent assembly, knowingly or unknowingly, is to destroy and disintegrate our country Nepal therefore it is time now for all of us to stand against this constituent assembly to fight for our country Nepal. Q. There is a state of chaos as the constitution cannot be implemented where as two constituent assemblies have been elected and the constitution has been promulgated. What is your take on this? Ans: The only way forward is to get rid of this constitution. I would like to remind you all that while this constitution was being written my Guru Yogi NarhariNath used to say to me why are you after this Constitution? A country like England does not have a written constitution and we Nepalese who had been ruling the world with the first and most humanitarian and the oldest constitution in the world the Manu Smriti are running after this new constitution. 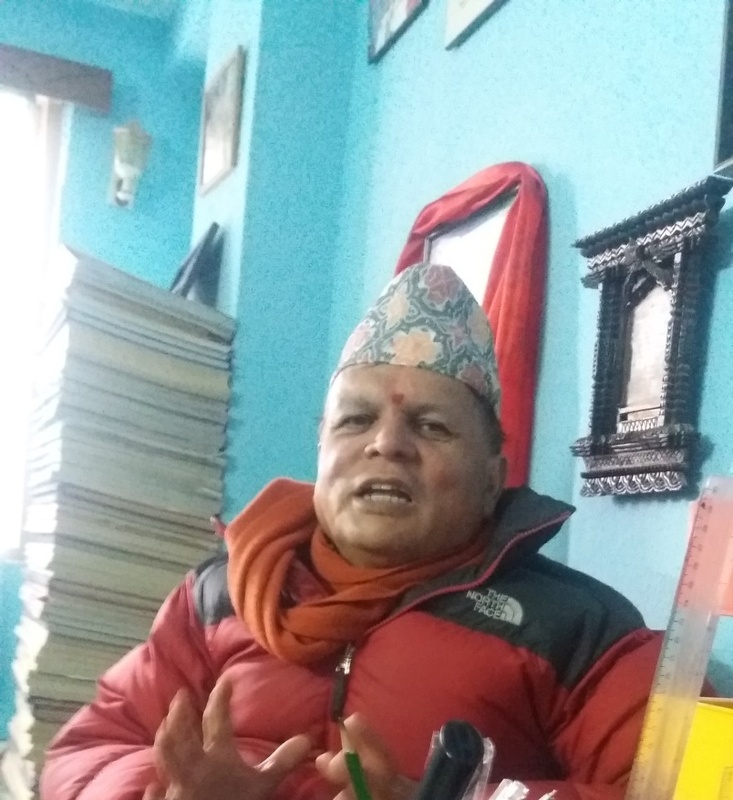 There is now a new force in existence these days that are stating that we should get back to the constitution of the 2047 which was written by eminent personalities of Nepalese politics like MdanBhandari, Nirmal Lama and Daman Dhungana. I believe that could be an alternate. It is high time for us to realize as the president of China Shi Zin Ping had stated that in this modern world it is no longer the war of ideologies but the war of the civilization and culture and the eastern culture will win. Eastern culture meaning the Hindu culture as all of this has arisen from the word Shindu civilization which was located at the banks of Shindu(Karnali) river from which the word Hindu was derived and changed to Shintu in China and Shintao in Japan and the westerners named the river Indus from the same word and that is how the country got its name India. All this shows that Nepal is the centre of civilization and one of the oldest civilization started in Nepal which can further be proven by finding of various archaeological excavation from various sites in Nepal. Q. Regarding the 2047 constitution how is it possible for it to come back? Does somebody stage a coup or some foreign power has to step in? Ans: Regarding this constitution we all know that all concerned are playing a part to destroy and disintegrate our country therefore I have been talking to various individuals and gatherings to unite and speak against what is happening at this juncture. After talking to me, various personalities like BP’s son PrakashKoirala, PL Singh, Mohan Vaidya, King Gyanendraetc have been active and voicing their concern at each and every opportunity. The army also came out with a statement and are in a state of high alert. We Nepalese inside and outside the country, from all walks of life should unite together and fight back and work together and know and revolt against the traitors of the Nepal who drink whiskey in Delhi with agitators who have killed patriots of Nepal. Q. But the people have not stood! Ans: No, no, the people are rising and have risen. The situation is no longer what it was yesterday. Something is happening and one or the other activities are going on. You yourself saw the unrest in the No 5 province and other provinces as well. Q. We all know that there is party politics in this country and the party cadres do not become active unless told by the party. So who is going to unite the likeminded public and when is it going to happen or who is going to unite them for the big push you are talking about? Ans: I am sorry to say but in all the changes that has taken place in Nepal the political parties were nowhere to be seen be it the 2007 BS democracy movement or the 2046 BS movement all the parties were in disarray. I was the one leading the people wearing a red bandana on my forehead in 2046 movement. I was the leader who led the artists and writers of Nepal from Trichandra Campus wearing black ribbon to show our dissent against the then autocratic government. I have been very much aware of the discontent and simmering of the people from my social media here and abroad and my personal contacts within Nepal. I am quite sure that like in the Middle East there is going to be an Arab spring very soon in Nepal. Q. The army you are talking about used to be known as ShahiSena is now known as Bhai(younger brother)Sena meaning they cannot do any work without the help of other more powerful army in South and people often are heard to be saying our army cannot hunt for its own food(meat) but is ready to eat it when someone else provides it so what do you expect from such an army? Ans: Rather than expectation from the army it is only the support from the army and understanding of not being against us when we begin the revolt and not to work for the present day traitors and be on their side. 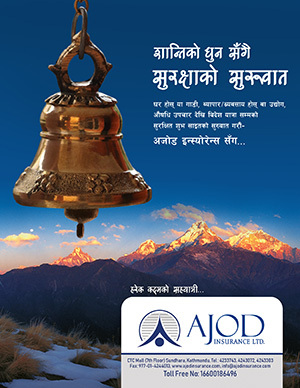 Furthermore, my job is to call on people from all walks of life and it is high time for all of us to realize that the corrupt government has pocketed all the money from our donors and the nation is being financed from the remittance that we get from the poor Nepalese who have been toiling in hard in difficult situations all over the world and shedding their blood, sweat and tears. The tax that our poor, naked and hungry farmers pay through their very hard earned money is being spent on the army and the uniformed services of our country. This is the same army that carry a flag with the emblem of Shiva’s Trisul and Damaru and has taken an oath of Manu’s principles. If this people’s army that is run by peoples’ money and taken an oath of the people does not take the side of the people in times of need of the people then probably the existence of the army in the future should be questioned. Therefore I believe that the Army will be for us and the people because just like myself there are many dynamic, young and patriotic officers in the army who will not remain quiet in times of need and will definitely help our cause.